Healthaid HEALTHAID PROSTAVITAL Product #: SOM Price: Rs.1395.00 Rs.1395.00	Available from: SAVEONMEDICALS.COM In stock! Order now! 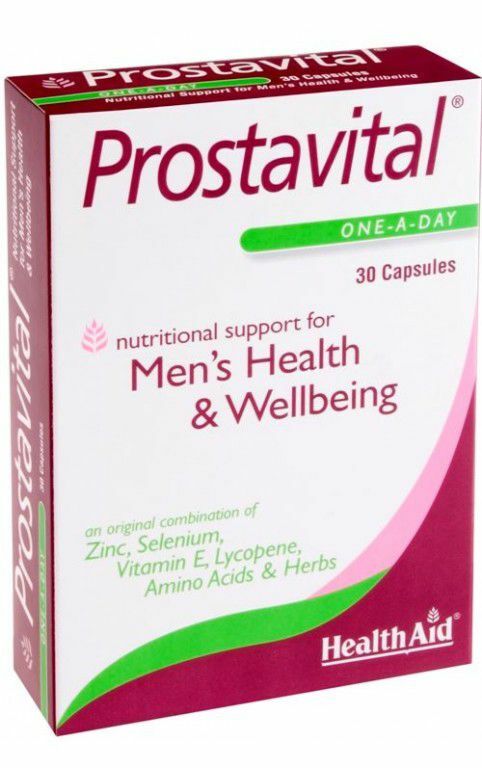 Prostavital Capsules are specially formulated and carefully balanced to provide an original combination of Saw Palmetto, Nettle, Pygeum & Pumpkin Seed Oil. Enriched with Vitamins, Minerals & Amino Acids for maximum effect. Optimum care for men. What is the frequency of use of HEALTHAID PROSTAVITAL? Have you been prescribed HEALTHAID PROSTAVITAL by a doctor? How do you rate HEALTHAID PROSTAVITAL on price? Q1) Is HEALTHAID PROSTAVITAL effective? Q2) What is the frequency of use of HEALTHAID PROSTAVITAL? Q3) Have you been prescribed HEALTHAID PROSTAVITAL by a doctor? Q4) How do you rate HEALTHAID PROSTAVITAL on price? Q5) What is your overall rating of HEALTHAID PROSTAVITAL?